The deputy chief of Shia Islamist group Hezbollah said that his terror outfit is desperately needed in Syria to stave off the advances of the Sunni Islamic State. Nabil Qaouk said Monday at a military ceremony in Aita Shaab that Hezbollah helped to calm sectarian tensions, which “disappointed the radical group,” Lebanon’s The Daily Star reported. The Hezbollah leader said: “There could never be a war of words between ISIS and us, but there is the field where we will defeat them. We will not engage in a war of statements or political disputes.” He added, “Day after day, it is becoming clear to Lebanon, the Arab, Muslim and international communities that there is a great need for Hezbollah to remain in Syria. The current situation today imposes on Hezbollah to stay in Syria more than any other time. Qaouk said of his host-country’s role in the ongoing hostilities: “This battle demands a change in national priorities,” suggesting the Lebanese Army needs to be prepared for more attacks from the Islamic State and other Sunni Islamist groups such as the Al Nusra Front. Clashes have recently erupted between The Islamic State and Lebanese forces on the Syria-Lebanon border. 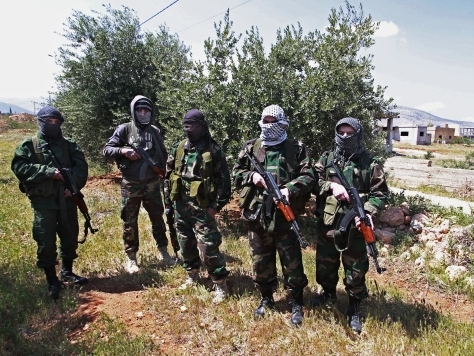 IS fighters were able to capture 22 Lebanese soldiers prior to a cease-fire, whose whereabouts are currently unknown. The Islamic State has thus far beheaded two of the captured soldiers in an effort to secure a ransom for their transfer. The terror group leader said Lebanon must act strongly to secure its future: “tighten the noose on the Takfiris (apostates from true Islam) and strengthen the ARmy so that it could free the soldiers,” he said. “Any delay in drafting a national defense strategy or in using strong cards would endanger the lives of soldiers and paves the way for Takfiris [to launch] more attacks and provocations,” he added. Shia Hezbollah is part of Iran’s proxy terror-funding network that includes Gaza-based Hamas and Bashar al-Assad’s regime in Syria, among other Islamist outfits. Hezbollah recognizes the Supreme Leader of Iran, Ayatollah Khamenei, as its ultimate authority. In 1999, Hezbollah was added to the list of US State Department Foreign Terrorist Organizations (FTO). The EU has also followed suit and blacklisted Hezbollah’s military wing.